The duties of any database administrator include responsibility for the management, control and safety of mission-critical information, and a primary concern of the Oracle DBA is managing their computer disk storage. 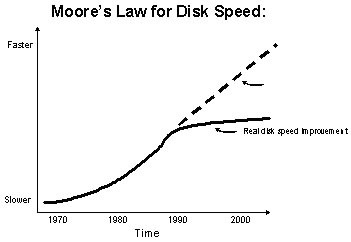 Also see my brief history of database disk storage. More than fifty years ago, IBM introduced RAMAC (random access accounting & control), the first in a long line of cumbersome and expensive database storage architectures. Disk platter storage continued to evolve through the 1990's, when engineers hit the physical limits of mechanical devices and RAM was introduced as a front-end cache. In the early 21st century we see RAM-SAN replacing the antiquated mechanical platters. As of 2006, the vast majority of hardware vendors (Sun, HP, IBM, UNISYS and Dell) offer 64-bit servers with far higher bandwidth than their ancient 32-bit predecessors. Note that Moore's Law does not apply at all to RAM and the speed has been fixed for nearly 30 years. However, RAM is quite different from other computer hardware such as disk and CPU. Unlike CPU speed, which improves every year, RAM speed is constrained by the physics of silicon technology. Instead of speed improvements, there is a constant decline in price. CPU speed also continues to outpace RAM speed and this means that RAM sub-systems must be localized to keep the CPUs running at full capacity. CPU speed continues to double every few years, while the speed of disk and RAM cannot boast such a rapid rate of speed improvements. For RAM, the speed has increase from 50 nanoseconds (one billionth of a second) to two nanoseconds, a 25x improvement over a 30-year period. At access speeds of two-billionths of a second, today's DDR SDRAM is stressing the limits of silicon technology, and it's unlikely that significantly faster speeds will be seen in the next decade. It is very clear than CPU speed will continue to outpace RAM speed and this has important ramifications for Oracle database processing. The advent of Non-Uniform Memory Access (NUMA) is predicated on the fact that data storage (RAM) must be localized as close to the CPU as possible to maximize throughput. NUMA has been available for years in high-end UNIX servers running SMP (symmetric multi-processor) configurations. The vendors know that NUMA technology allows for faster communication between the distributed RAM in a multi-processor server environment. NUMA is supported by Linux and Windows Advanced Server 2003 and is a feature of the Intel Itanium2 chipset, which is used in the latest Oracle server blades for Oracle Grid computing. In my book "Oracle Solid State Disk Tuning", smaller solid-state RAM disks have far less bandwidth issues because the RAM architecture of SSD allow high concurrent access that is impossible on a mechanical platter. Oracle 10g has become NUMA -aware and the database engine can now exploit the high-speed L2 cache on the latest SMP servers. According to David Ensor, a recognized Oracle tuning expert, author, and Former Vice President of the Oracle Corporation's Performance Group, the inordinate increase in CPU power has shifted the bottleneck of many systems to disk I/O, as the disk technology fails to keep-up with CPU. For a full discussion, see my whitepaper on Oracle tuning with solid state disks. It's clear that solid-state devices are making huge headway, and several books on Oracle SSD tuning and stepping-up to the new technology. With prices falling rapidly, I expect that most database will be solid-state in the next few years and that disk will become the "new tape", offline tertiary storage for backups.